Where to find Tossa de Mar hotels near an airport? Where can I find hotels in Tossa de Mar that are near tourist attractions? If you're planning a vacation in the Costa Brava region and you're looking to book accommodation in Tossa de Mar, you have an extensive array to select from. Expedia lists 122 hotel options within a 0.1-kilometre (0.06-mile) radius of Tossa de Mar's heart. 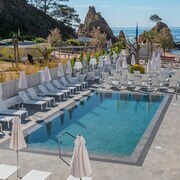 Convenience is so important when it comes to trouble-free vacationing, so check out the Hotel Tossa Mar and Premier Gran Hotel Reymar & Spa, all of which are within a 1-kilometre (0.6-mile) radius of Tossa de Mar's downtown area. 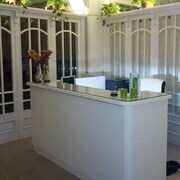 The URH Apartaments Gales and the Giverola Resort are close to the Tossa de Mar Beach. The URH Apartaments Gales is 0.2 kilometres (0.1 miles) away from the Tossa de Mar Beach. The Giverola Resort is 2 kilometres (2 miles) away. If you're traveling on a budget, you will be happy to learn that there's a broad selection of lower-priced places to stay in the vicinity of Tossa de Mar. 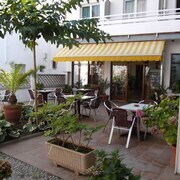 0.2 kilometres (0.2 miles) from Tossa de Mar's downtown is the Hotel Don Juan Tossa. The URH ParkHotel is only 0.2 kilometres (0.1 miles) away. 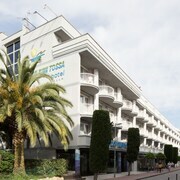 Two more Tossa de Mar hotels in the lower price range are the Hotel URH Novo Park and the Hotel Marina Tossa. 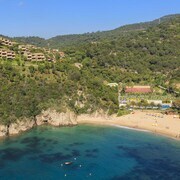 The Alva Park Costa Brava is situated 9 kilometres (5 miles) away from the center of Tossa de Mar. 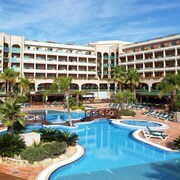 Another option is the Mas de Torrent Hotel & Spa, which is located 30 kilometres (19 miles) away. More options around this area are the Hostal de la Gavina and the La Malcontenta. 30 kilometres (19 miles) from Tossa de Mar you will find Girona, where you can find Girona Cathedral and Arab Baths. Should you wish to spend a few nights in Girona, check out the room rates at the Hotel Nord 1901 and Hotel Museu Llegendes de Girona. Or stay in L'Estartit, 45 kilometres (26 miles) to the northeast of Tossa de Mar, where you can pick from the Clipper Hotel and Casas Bell Raco A. The Calypso Diving International and La Sirena Diving Center are popular sites to experience when you're in L'Estartit. If you are flying into or out of Costa Brava Airport and are looking to stay nearby try Meliá Golf Vichy Catalan or Salles Hotel Aeroport de Girona. What are the most popular Tossa de Mar hotels? Are there hotels in other cities near Tossa de Mar? 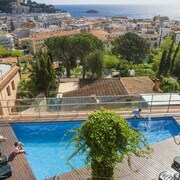 What other types of accommodations are available in Tossa de Mar? Explore Tossa de Mar with Expedia.ca’s Travel Guides to find the best flights, cars, holiday packages and more!